Technology is increasingly being used to power modern education. From tracking and using data, to powering communication and engagement, NewAperio has built custom web and mobile for clients across the education spectrum. Education is one of the primary industries NewAperio serves. Read on to find out more about the kind of work we've done. One of the most powerful ways technology can be deployed into educational environments is to improve the learning outcomes of students. Apps to enhance education delivery, assist teachers in being most effective, or targeting specific students can be built to optimize learning and improve overall outcomes. For one client, NewAperio helped leverage massive data sets to prepare highly targeted learning plans for individual students. By combining big data insight and custom apps, learning materials were delivered in a more targeted and efficient manner, leading to higher achievement and education successes, for the student, teacher, and school. Education is a massive data producer. On a daily basis, teachers are recording data and making notes about individual students for reporting and accountability purposes. These processes are often legally mandated, but seldomly optimized — instead, they are often old-school, relying on paper forms turned in on a schedule. NewAperio has built modern, real-time systems to supplant these paper forms in legally compliant ways. By modernizing the feedback process, data was reported quicker and more accurately. This in turn created more opportunities for education teams to build learning plans that improved student outcomes — a true win-win situation. Studies have shown that one of the most important ways to improve student performance is by engaging parents in their child's education. By making them a part of the process and keeping them apprised of their student's performance and progress, it's estimated that parents can more than double the efficacy of classroom instruction. The findings are even more pronounced when considering other objectives, such as attendance and graduation. In previous projects, NewAperio has helped clients build real-time messaging systems to put teachers, school administrators, and parents in a tight communication loop. In one case, when working with a charter school that served more socioeconomically disadvantaged kids, we discovered that SMS wasn't a viable communication medium since parents — often on pay-as-you-go mobile plans — didn't have consistent phone numbers. By leveraging custom native apps and push notifications, we were able to build a resilient messaging system that allowed parents and educators to stay in touch even amidst changing phone numbers. For many educational institutions — particularly those of higher learning — the education lifecycle starts with recruitment. But how do you reach and engage kids of today, who live in a constant social media barrage? Even more, how do you influence them when there are hundreds of other options vying for their enrollment? For LSU's Computer Science program, the answer was to build an innovative, unique game that captured prospective CS students' two biggest interests: gaming and hacking. 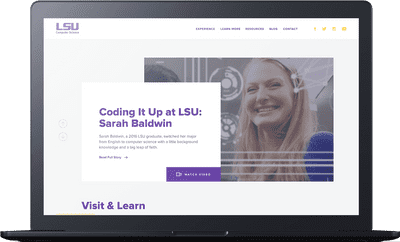 Working with the CS school, NewAperio conceived, designed, and built the Code It Up campaign and Challenge, which ultimately exceeded expectations and helped the university meet its enrollment targets.